We all know of Buzz Lightyears unquestioned ability to fall in style, but he may have a new rival in the form of the Gliding Ants from Peru. 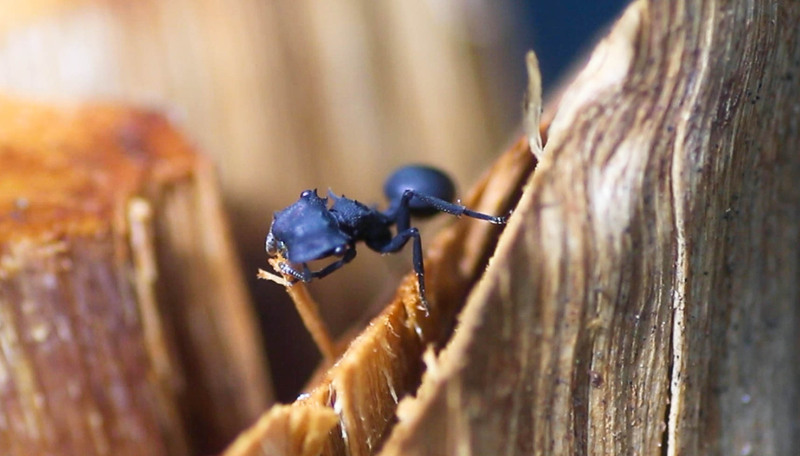 Cephalotes atratus is a species found in the canopy of many neotropical forests, but it is no normal ant, because it exhibits this fascinating, almost magnetic attraction to glide back to the trunk of the tree from which it came. It was a researcher from Berkely who noticed this, whilst sat in the canopy of the Iquitos jungle, when he brushed off a number of ants that were investigating his presence on their tree. That's when he noticed that rather than dropping like dead weight and randomly falling into the undergrowth, a group of ants soared and planed around the tree, until finally cascading back onto the original tree trunk. This video was created to compare a non-gliding and a gliding ant, both dropped from a tree. Video courtesy of Steve Yanoviak. So what is the evolutionary driving force behind this adaptation? Well, being blind, they communicate through the ability to sense and release pheromones. As such, when they fall off a branch straight onto the jungle floor it is likely they would be unable to find the chemical pathway back to the colony leaving them lost, alone and vulnerable to predation. I was lucky enough to encounter a few in the jungles of Manu National Park whilst working last year. In fact, one is the star of the little video "The Tasty Wood"! Check out the dark flat head, spiny back, rounded yet flat abdomen and long back legs, all tools for Controlled Aerial Decent, also known as "falling in style".